Reached the peak of Burnaby Mountain in 34:50 but damn was my heart pumping on the last stretch of Cardiac Hill! I made it to the top of Burnaby mountain in 32:40, which is an improvement of 1:50 from Wednesday’s time – but damn if it didn’t kill my lungs doing it!!! Hiking up Grouse Mountain and doing the Grouse Grind can humble you on the best of days…even more so when you are wearing a 20 lb weight vest…I like to refer to the Grind as THE STAIRMASTER FROM HELL!!! At least I made it to the peak of the mountain under 1 hour and 45 minutes. It was very tough going up the mountain with the obvious added 20 lb weight on my shoulders, plus my backpack with 3 bottles of water, but once you reach the clearing at the top, it makes it all worthwhile! The popular Grouse Grind® is a 2.9-kilometre trail up the face of Grouse Mountain, commonly referred to by Vancouverites as “Mother Nature’s Stairmaster.” Over 110-thousand hikers a year take on the challenge of the rugged terrain and steep climb, starting at the Valley Station and finishing at the Peak’s plateau, for a total elevation gain of 2,800-feet. The average climb takes just over an hour, with beginners requiring up to two hours to complete the trek. Average Time: On average it takes up to an hour and a half to complete the hike. For novice hikers, up to two hours is recommended. 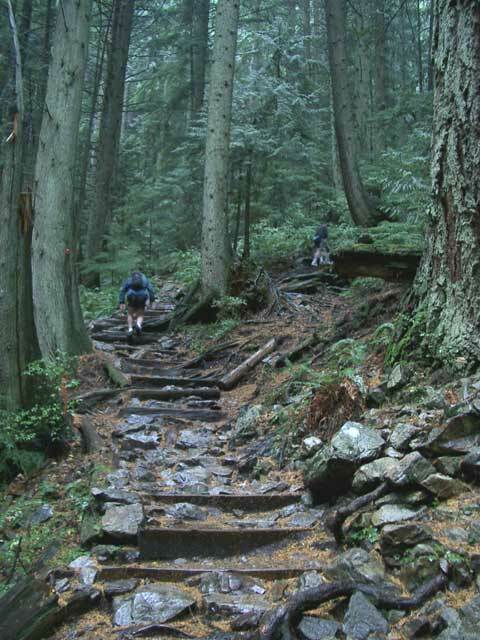 The official course record to date for men is 26:19 held by Michael Simpson set at the 2007 Grouse Grind Mountain Run®. For women, the record is 31:04 held by Leanne Johnston and set at the 2007 event. Unofficially (that is, a record set outside the annual Grouse Grind Mountain Run®) the course record is an amazing 24:22, set by two-time World Mountain Running champion Jonathan Wyatt of New Zealand. Jonathan set the record in June of 2004 while visiting Vancouver. The renowned runner has also participated in the Olympic Games and the Commonwealth Games. Holy $hit I am tired after today’s workout…it’s 8:30pm and am thinking very seriously about going to bed in the next 15 minutes…but I am very pleased with the results from today’s hike and more so from the simple fact that I completed it after doing an hour of Plyometrics! Once I got to my condo, I picked up my bike and rode back down to the base and picked up my car.I was surprised to see that even with the 20 lbs weight vest, my time still IMPROVED so that was pretty sweet!